I may have missed my weigh-in update last week, and admittedly, I wasn’t 100% on track with my healthier eating. Despite that, I still managed some small success! 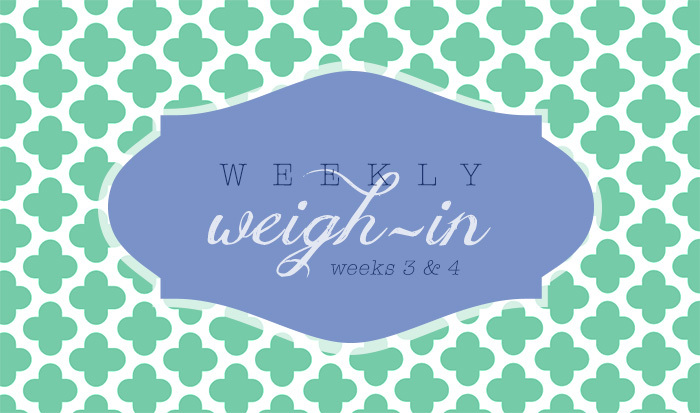 Last week’s weight: 158.4 lbs. Last week’s weight: 158.2 lbs. I am officially down 6 pounds in 4 weeks. Woohoo! Week 3 started out well enough, but the latter part of the week was when work picked up. I skipped breakfast a lot of mornings; I just didn’t have time to eat once I got to work, like I normally do. Not good for your metabolism! I also went running out the door every morning without packing a real lunch, so most days meant a take-out lunch. I made fairly healthy choices, but I still found it difficult to stay under my calorie max when I wasn’t making my own food. On the plus side, I did pack myself healthy snacks (fruit, nuts, granola bars) to munch on during the day. Week 4 was better; things were cah-razy, but the weekend & start of this week have been pretty good so far. Matt and I didn’t go out to eat a ton over the weekend, nor did I have many drinks. Plus, I’m sure running 7 miles on Saturday morning, followed by 3 hours of bowling, helped torch some extra calories! 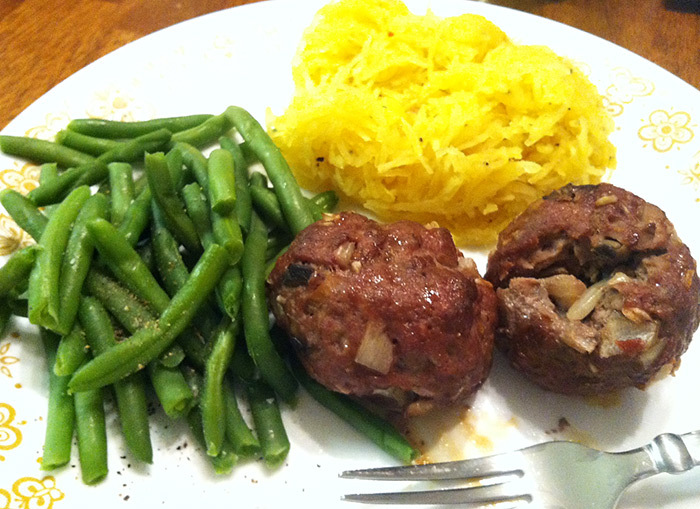 Homemade meatballs, Italian seasoned spaghetti squash, and green beans. I made the meatballs with 95% lean beef, chopped onion, mushrooms and french onion soup mix, and popped them in the oven to bake. So tasty! Next time I’m going to add an egg to help them stay together and add a little moisture, but Matt and I were both fans of this simple recipe. 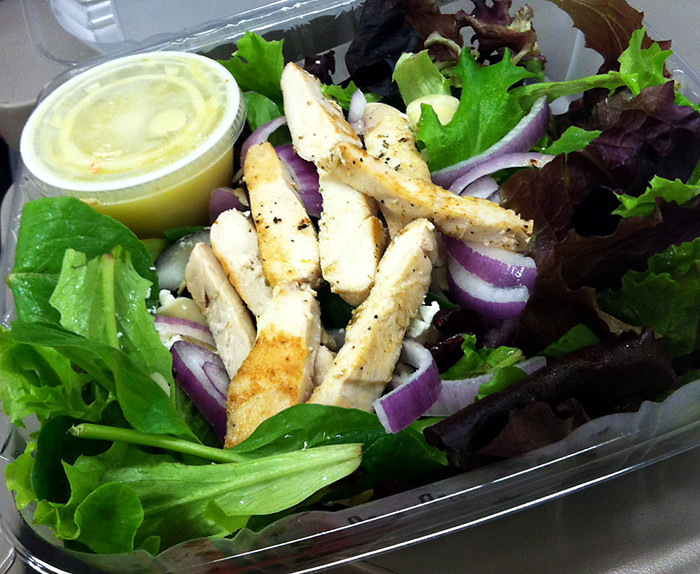 Take-out spring salad with feta, cranberries, red onion, grilled chicken and white balsamic dressing. These flavors are sooo delicious together, and definitely “springlike.” The salad wasn’t super filling though, so I rounded it out with a handful of almonds. Choco-peanut-banana smoothie. My Magic Bullet is making a comeback. I threw a large banana in the freezer (TIP: peel it first…); then blended it frozen with 1 tbsp. 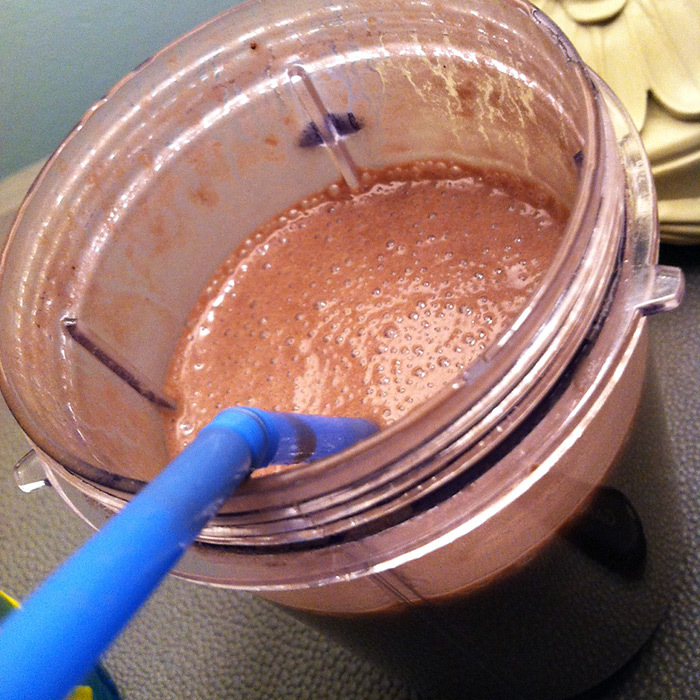 peanut butter, some cocoa powder, 3/4 cup unsweetened almond milk and a couple ice cubes. It was a good dessert, almost like a milkshake! You could totally add some protein powder or greek yogurt to make this even better for you. Another smoothie combo I liked for breakfast on-the-go was a blend of: 1 cup unsweetened almond milk, 1 scoop vanilla protein powder (or 6 oz. vanilla greek yogurt), and 1/2 cup frozen strawberries. Do you have any go-to smoothie recipes? Let’s sum up this day in two words: Chilly. Chili. 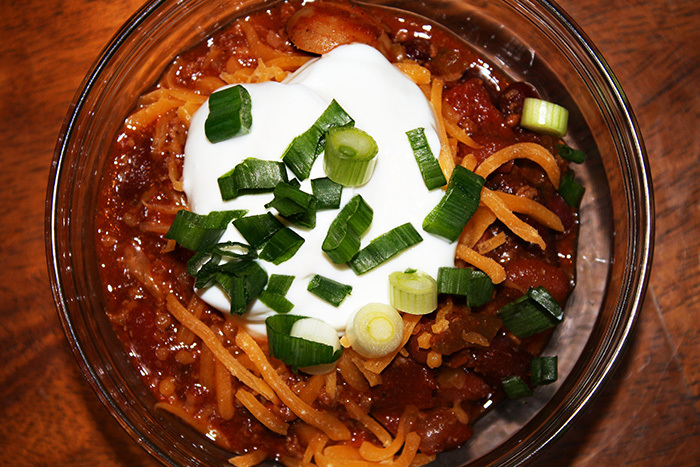 The polar vortex is back, but this time I’m arming myself with a warm, hearty chili! 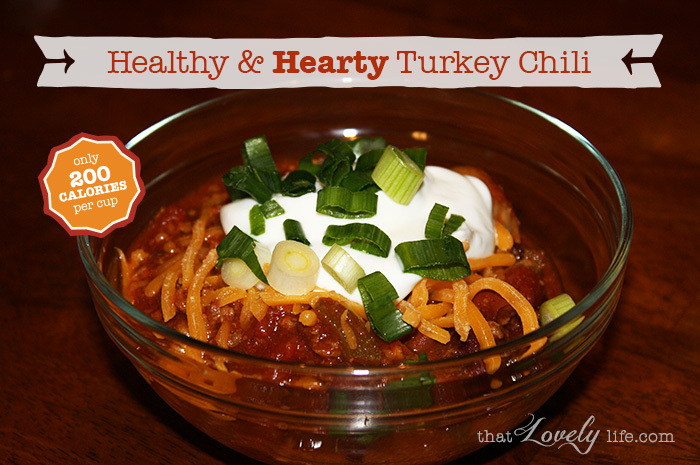 This lightened-up turkey chili recipe is super easy and quick to make, and will only cost you 200 calories per cup—yes, really! It’s delicious, and of course, good for you, too: With the mix of lean protein from the ground turkey, and fiber from all the beans and veggies, you’re stomach won’t be growling for hours. It’s the perfect bowl of comfort food on a cold night—whether you’re watching what you eat or not. In a soup pot over medium heat, sauté onion, bell pepper, garlic and celery for 5 minutes. Add ground turkey; cook until crumbled and no longer pink. Stir in diced and crushed tomatoes, mushrooms, chili beans, and kidney beans. Bring to a boil. Stir in packet to chili seasoning. For a little extra heat and flavor, add in cayenne pepper, smoked paprika and oregano. Reduce chili to a simmer, leaving the lid off to boil away excess liquid. Let simmer, stirring occasionally, for at least 20 minutes to meld flavors. 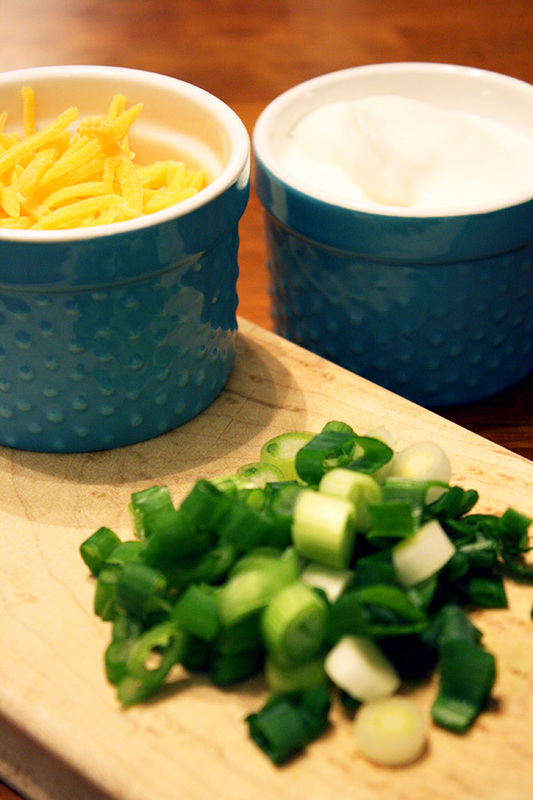 Switch out the usual suspects with some healthier options, like a dollop of plain greek yogurt instead of sour cream (you won’t notice the difference), low-fat shredded cheddar cheese, hot sauce, or chopped green onion for some extra flavor. What other kinds of healthy recipes would you like to see?